We do love to dig a hole for ourselves, don't we. Once again we have managed to come out of it though. We could have gone through more easily if we had played the first half properly but alls well that ends well. THis year the team has been reactive instead of proactive. Good game guys... at least for PSG Messi saved it for you guys, which is what he does. PSG will be there next year. They're on every good fullback prospect in France (Aurier, DIgne, Corchia and Umtiti) and also looking at a wing striker to put next to Ibra (Aguero and Benzema). You got through and that's all that counts. Clearly the team to avoid is Bayern imo. But I also don't want another clasico... i'm kind of sick of clasicos tbh. @The Franchise wrote: Very little to celebrate, crawling over the line like wounded dogs. Sorry, I cant help it. Aint been this upset about getting to a semi ever, perhaps because I know we wont win playing so pathetically. Somehow I felt sorry for PSG. Who would of thought it. You can say that dani but who deserves kudos besides Bayern. Dortmund played like cowards for most of their match. Madrid needed several terrible decisions and even then had to struggle to get past no greater than Galatasaray. We have also scraped through but now that we are there we can take on anyone. Sick of Classico's when we was winning, let alone losing or struggling. Dont matter who we get, we wont win playing like this. For PSG, I gotta tip my hat to the boy Lucas. Ran everyone ragged. For me Best Player is Valdes. He basically saved us. And Barca is not a one man team but there is only one player who can motivate the whole team through appearance only and during his time in Barca it will not change. Time to celebrate who cares how we played, we are in semi record times. Semi is still two weeks to go. Plenty of time to correct. I dont think Dortmund played like cowards, they were the better side and made many chances. Madrid, doesnt matter. When they play us, they will have the mental edge..then add on they are a better pressing team than us now. We can win, simply because we are still there...but with a performance like 3 out of the last 4 CL games, we are going home easily. @neuro11 wrote: For me Best Player is Valdes. He basically saved us. Agree about Valdes. Not the rest though. Plenty of time to correct? I mean, the Milan tie alone wasnt enough to show we have to press? If we still dont do it after all that, why are we going to do it later? yeah... Lucas is going to a gem. very good kid too. 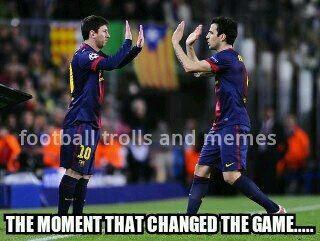 As far as clasicos, now it's the same players and the exact same tactics every time. At least in the past, Madrid changed everybody every 12 months so there was some drama to it... now, i already know what the game is going to look like. So boring. Both of us need to avoid Bayern. I don't think either of us can feel confident against them. They're balanced... which is the exact opposite of both Barca and Madrid. Let's do en exercise of the imagination. But...... just unfortunately, the ball goes to his left foot. He tries to rapidly control it and switch it with his right, but the ball bounces off from his left leg as if hitting a tree trunk. The control is not good, but he still seems to be able to reach it and connect a thunder with his right.... just when Thiago Silva makes a dive tackle and clears the ball while Alexis falls on the floor claiming for a penalty. Fortunately, this never happened as Pedro was playing. It would have happened last season. But we learned. He did nothing apart from that goal. Iniesta had to become a winger because he was too always wide, and often unmarked. I didn't see Pedro making a single diagonal or behind the defence. Also the goal Barcelona conceded was because of his abysmal play. I genuinely think Tello is better than him. Just buy yourself some glasses. Pedro dribled Jallet serveral times, delivered dangerous crosses, and put inmense energy. And how is the goal Pedro's fault? @The Franchise wrote: Sick of Classico's when we was winning, let alone losing or struggling. dani, I am sick of Classicos too. If it has to happen let it be the final. Also we will not always play like this. Somehow the problem is nowadays we are more likely to play well when we are in trouble. For reasons not very clear the approach isn't right from the word go. I agree with you though. We can't continue to dig holes for ourselves because a time will come when we will not be able to find the way out. Moura gave us too much trouble but Verrati's passing was special as well. Sorry for PSG? We were the better team on 180 minutes. It's worrying how bad we press though. It's ridiculous. Only player pressing well was Pedro. I wouldn't even press if we have to do it this badly, we are leaving players alone to receive the passes all the time. Btw, Busquets was pathetic today. Terrible, terrible. Worst game from him on a Barça shirt since 2008-09. @free_cat wrote: Just buy yourself some glasses. Pedro dribled Jallet serveral times, delivered dangerous crosses, and put inmense energy. I would say the last 3 out of 4 CL games its exactly how we play like. Also the last 3-4 games vs Madrid. You can say whatever you want, because you would only humiliate yourself. Valdes was our best player, but Pedro was good the whole match and we are in the semis thanks to him. Playing Adriano today was stupid. He didn't do any big mistake, but he was nowhere to be seen in both PSG big opportunities (lavezzi and Pastore's goal) and again got injured at minute 60+, wasting a sub. I hope Bartra is the starter from now on. He was much better and won't get injured every match. @The Franchise wrote: I dont think Dortmund played like cowards, they were the better side and made many chances. dani, on Dortmund this will be one of the rare times we disagree. In the first half I saw a team petrified to the extent that I can't remember when last I have seen a team so scared in the UCL knock out match. They seemed too afraid of what the opponent could do and just didn't play their game. Tempo was completely missing. The zip and slickness with which they move the ball from one end to another was totally absent. As the home team, the better team and the team who needed to score, they should have done much much more. Yes they deserved to go through over two legs but so did we. You can give them more credit because they are much more rookie than us but in truth neither team impressed. We were the better team overall, slightly yes. But I think they played much closer to their best than we did, they put in more effort than we did and more importantly, they played with bravery.....I do feel something for some of their players who put in a good effort. The pressing in midfield was pathetic. Cesc and Villa arent the most energetic guys in the world, but what excuse does the midfield have (all 3 of them at different times) for constantly arriving late. Verrati had all the time in the world, man was taking 2 touches, turning around 180 degree and then passing at times It was woeful. Sometimes you don't play well but you get the result needed. Some say that's what great teams do. Let's not forget we are in the semis for a record sixth straight time. I guess a team or even the only team to do it five times must have been Real Madrid of 1956-60. So for that reason at least I would like to credit my team.